More and more people are reading on a Kindle. Just like an iPod and iPhone, a Kindle should be enclosed in a case. Acme Made has recently released the Hardback Folio, which is now my Kindle cover of choice. If you are the kind of reader that needs room for a pen and paper within the case, keep looking. The Hardback Folio is simply a Kindle cover, no more or less. And it does its job superbly. The Hardback Folio outer cover is made of linen, and looks like a book, complete with spine, while the interior is lined with soft microsuede. 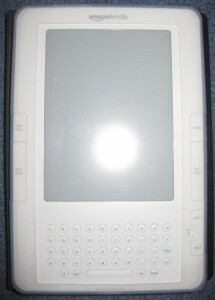 The Kindle is placed in a silicone skin that uses Acme Made’s proprietary technology, called ButtonDown, which enables the Kindle to be rotated for left or right-hand use, then buttoned into the cover. An elastic strap keeps the Hardback Folio closed when not in use, and holds the front cover securely against the back cover while reading. The DX model can be turned into an easel for horizontal display. Using my Kindle 2 with the Hardback Folio was a pleasure. It took me less than two minutes to get my Kindle in the silicone skin and buttoned in to the cover. The Kindle was totally secure and protected, whether I was reading in bed or out by the pool. All controls, including the charging port, are easily accessible. The opening for the 5-way controller does have a tendency to shift just a tiny bit, but it’s enough to make using the controller a bit more work. 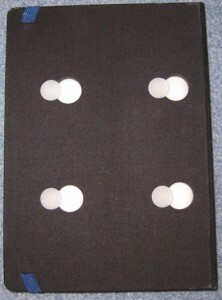 I used my long fingernails to manipulate the 5-way controller; the pads of my fingertips didn’t work as well. Keep in mind this was just my experience and not necessarily the fault of the silicone cover; your mileage may vary. Attaching an eBook light was simple and never got in the way of the cover or reading enjoyment. There are cutouts for the two speakers on the back of the Kindle. Although the speakers face the back of the cover, I could hear the voice for the Text-to-Speech function loud and clear. If you own a Kindle 2 or Kindle DX it should absolutely be placed in a cover. 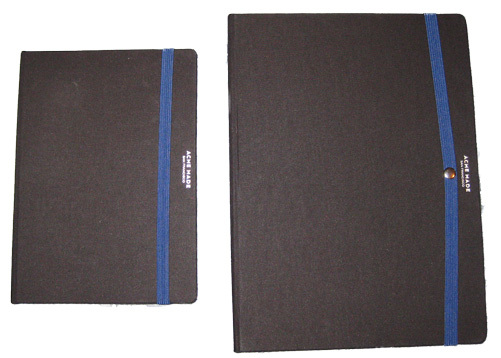 I highly recommend Acme Made Hardback Folio for its simplicity, security, good looks, and price.